This was a strange short story that packed a twist. A dark one, or not. Lydia wakes up in a strange world. A carnival where there are vampires and others. And they say she is a stranger from another world. She meets someone and she sort of finds herself too. May not be my cup of tea but glad it worked for you. This was the first in the book if I recall. I remember liking, the setting was great. Okay 2 good points - meet someone and finds herself. Perfect! Hmm, ever since reading Wake of Vultures which she wrote under a pen name, I've been interested in her other work. Omg I did not realise! Oh cool! I have this anthology sitting on my shelf waiting for my attention. Glad Delilah's story was good. Love the Blud series. Oh, this is a novella. But it's interesting. I somewhat have heard about Carniepunk? Oh, I read parts of this anthology when it first came out. There is a Jennifer Estep short in it too. Really good! Oh yay! I enjoyed the Blud series and didn't know about this. That sounds different and different can be good. Oh I have been enjoying the Carnepunk stories. I didn't know some of the shorts were free. Nice. Sounds like a nice, quick read. 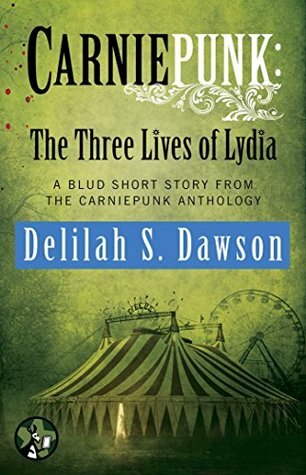 I love Delilah S. Dawson, and her books under the pseudonym Lila Bowen too. She does dark and creepy stories really well!